East Coast Mechanical is a full-service AC installation, replacement, repair, and maintenance company. We’ve been serving the Boynton Beach, FL area for over 30 years, and we’re still going strong. In fact, today, we are proud to have a fleet of over 120 service trucks serving South Florida. Whenever you need quality AC service from the best AC company in the area — call East Coast Mechanical! Having your air conditioning unit break down when it’s scorching outside is one of the most frustrating things that can happen. East Coast Mechanical is ready to be there to fix the problem with speed and efficiency. Give us a call any time, day or night, and our technicians will arrive to repair your system and return comfort to your home. That’s right, we offer 24/7 emergency AC repair to ensure that you don’t have to go more than an hour waiting for help to arrive! 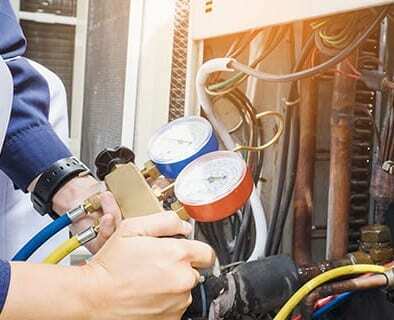 No other air conditioner installation company in Boynton Beach can provide the high-quality AC installation and AC replacement services that we do at East Coast Mechanical. We start with a complete 99-point home survey to measure air flow, identify the hottest rooms, and determine the best air conditioning system for your home. Once we’ve helped you choose an air conditioner that fits your needs and budget, we’ll perform the highest quality, most professional AC installation in South Florida. Seriously, our installation service cannot be beat! Usually, air conditioners that break down often or use too much energy are the ones not getting regular maintenance. At East Coast Mechanical, your comfort is our goal, and we’re not happy until you are. Allow us to assist you with any and all air conditioning services, from small repairs to tune-ups to full system installations. Call us today!